Danio — Creative Coming Soon & Maintenance Mode Template Created by ItembridgeThemes. This templates have specific characteristics, namely: Danio is a modern interactive coming soon page, suitable for any type of website because of its universal design. Fully responsive, it works from large desktops to mobile devices. It is packed with jquery countdown timer, mailchimp subscription form and ajax contact form and has 2 extra sub-pages – . You can use this Danio — Creative Coming Soon & Maintenance Mode Template on Site templates category for coming soon, coming soon page, coming soon template, creative, maintenance, maintenance mode, minimal, one page, under construction and another uses. Danio is a modern interactive coming soon page, suitable for any type of website because of its universal design. Fully responsive, it works from large desktops to mobile devices. It is packed with jquery countdown timer, mailchimp subscription form and ajax contact form and has 2 extra sub-pages – About Us and Contacts. The template is extremely easy to use and customize. If you’re looking for something trendy, that’s your top choice. Simple & Universal. Totally universal! Due to its specific design, the template will surely fit any type of website, even thematically specific ones. Moreover, it has simple structure, so its usage and customization won’t cause any difficulties. Unlimited Variants. We prepared 11 stylistically different demo variants of template for you to choose an ideal one. Try each of them and enjoy their functions. However, you are not limited with ready variants. Express your imagination and try unlimited opportunities to create your unique style. Responsive design . Danio is a fully responsive template and will look fine, regardless of the device it is viewed on (desktops, tablets and smartphones). We integrated a smart sizing engine for a perfect display of theme in all window sizes. Retina ready. Template owns a pixel-perfect design and is coded with the highest quality of graphics. Its images, fonts and texts become eye candy for every customer. Clean and well documented code. Perfect, valid, well organized and commented code makes it easy to customize the product you have bought. We use the power of CSS3 and HTML5 to create amazing and custom coded items. 6 Background Styles. Comes with 6 background styles, that can be customized the way you want: Image Background, Slideshow Background, HTML5 Video Background, Youtube Background, Gradient Background, Color Background. Choose one to your taste. 2 Additional Content Pages. Comes with two additional content pages – About Us (here you can describe your company’s activity, introduce you team members, show your portfolio or present certain products) and Contact Us (consists of your contact information). Bootstrap 3.2 Compatible. Easy to customize, offers great amount of HTML elements, CSS components, jQuery plugins and other reusable components to make the template ideal for you. CSS3 animations. Template uses the latest CSS3 animations making the overall experience smooth. It’s a great way to grab the viewers’ attention towards your content. Set the animation type, direction and speed to display the content just like you want. 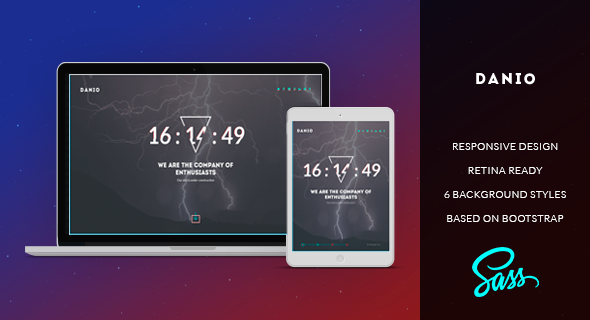 jQuery Countdown. The countdown timer counts down in seconds, minutes, hours and days to any date and informs your customers about the website release. Easy to set up and allows you to set you own date for countdown script. Working Contact and Subscribe forms. Discover our super stylish Contact and Subscribe forms, that make your website unique and functional. Adding subscribers becomes easier then ever! Mailchimp Integrated. A great tool to send beautiful newsletters and announcements, helps you to create a mailing list for notifying visitors about the website launch. Google Maps integrated. Integration of Google Maps is hugely beneficial, as it is far more useful than just writing down your address. Scrolling around provides the accurate information what people are looking for. 5 Stars Support. We provide fast and high quality support for all our customers. Feel free to contact us, if you find yourself in need of technical support. We try to respond to everyone within 24 hours period. Extensive HTML Documentation. Simple and intuitive step-by-step documentation is full of important and easy to use materials for you to understand all our item’s secrets. FOR A QUICK SOLUTION OF YOUR PROBLEM WE RECOMMEND TO CONTACT THE CUSTOMER SUPPORT AT OUR SUPPORT SITE. We appreciate your time, so we worked hard to make an appeal to the support convenient and comfortable. You must understand that we also appreciate our time, that is why we strongly recommend not to seek other ways to appeal to the support, and immediately create the ticket at the support site. The customer support runs on weekdays from Monday to Friday from 9:00 am to 6:00 pm GMT +2. Some days of the year turn to be holidays, respectively, we can not give you support then. However, we will inform about those days in advance.